As I told you last week, I’ve been writing more than ever in recent months, but very little of it has been here on So Much More Life. I’ve been writing a lot for clients, but I’ve also been writing and working on some other projects — and I want to tell you about some of them. I also took some time this spring and summer to renovate a couple of domains that have been part of my life for years. Part of simplifying my online life has been to clean up messes I’ve left all over the Internet in years past. First, I revisited the old GayScribe.com website that once served to promote my original career, writing for gay and lesbian newspaper. For years, this site has served an archive of some of my nearly-lost work in that genre, but it was designed in obsolete software. Now, the site has been recreated using WordPress. It doesn’t look too good now, but the bones are strong and it can be made to look better as soon as I find the right theme. As I locate old clips, I can also get even more of my old gay press articles online, preserving them for whatever value they have. I find that people still enjoy reading this content even if it’s sometimes out of date. The site gets more hits than it deserves, and I don’t quite know why. Until the last couple of years, I made a great living selling books online. I never really developed my domain name for this business, however. For years, BookRescuer.com sat around wasting space on the Internet. Now, I’ve placed some useful articles about online bookselling at the site, and it’s already starting to get some hits. The site desperately needs a better theme and some thought put into what else I want to say there, but it’s up, it’s good and I’m glad it’s serving a purpose. Selling books may not be a big part of my future, but it seems right to share what I know. I’ll share more about all my writing projects another time, but all this talk about the front yards, gay press and selling books is getting us a bit off topic, don’t you think? 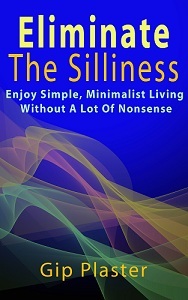 Let’s get back to simple, deliberate living. And let’s do that really soon.